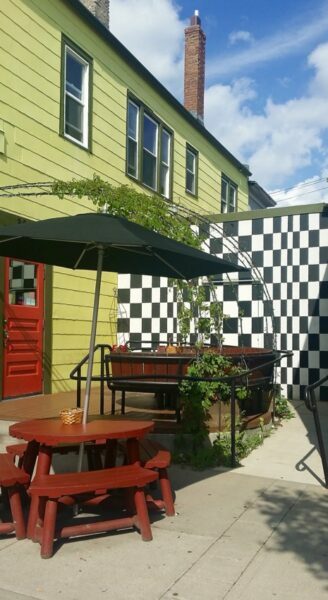 We are thrilled to have been featured in some recent Twin Cities blog articles! The first is from Bootler (gobootler.com), an online food delivery service. It’s a little blurb about Galactic, check it out and take a look at Bootler‘s website. The second article is a really great in-depth piece by Dining Duster. They’re a husband-wife blogging team who travel for work and write about their foodie experiences. Read the original article here, or scroll down for a great read! This awesome pizza place offers new and creative pizzas! The Thailander, which is absolutely amazing, is composed of spicy peanut sauce, mozzarella, green onions, sprouts, chicken, peanuts, cilantro and oyster sauce. Yum! Many of the ingredients in their pizzas are organic, too! They also have scrumptious vegan and gluten-free alternatives! Thanks to our Instagram feed, we have a very long list of places we wish to eat. 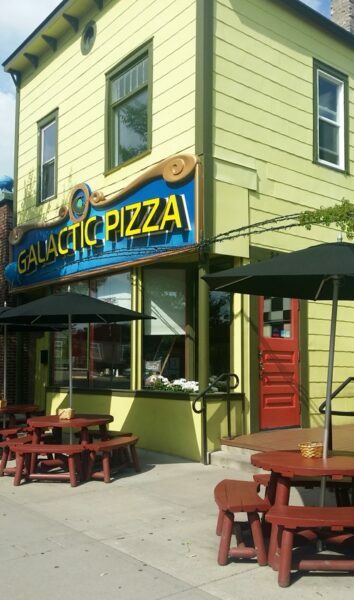 Galactic Pizza has been on our list and we’re happy to report it met our expectations! 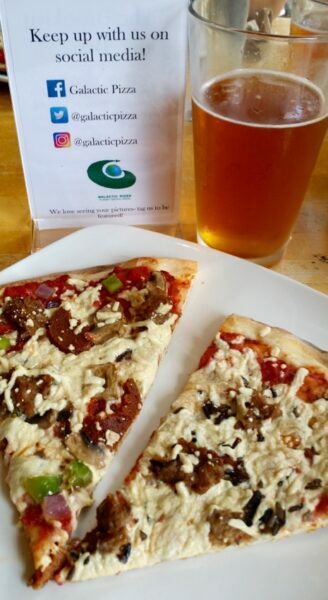 One reason we’ve wanted to check out Galactic Pizza is that they offer meat & dairy-free pizza. We love to eat out (hellooooooo…DINING Duster) and switching to a whole-foods, plant-based lifestyle has not changed that. We have ordered pizza a few times when eating out but had to modify what was on the menu due to no vegan options. There was that one time we ate pizza in Wisconsin and dared ask for a Greek Pizza with no feta! The waitress, stunned, said, “it’s like you can’t even eat real food”. Read more about that experience here. The real issue here folks is who wants a pizza without cheese or meat? That’s the reason we wanted to check out Galactic Pizza. Imagine our delight to open a menu and find plenty of pizza choices with vegan options! Our waiter wasn’t stunned when we ordered our pizza vegan and he even suggested we shouldn’t dream of leaving without ordering a piece of cheesecake, vegan! 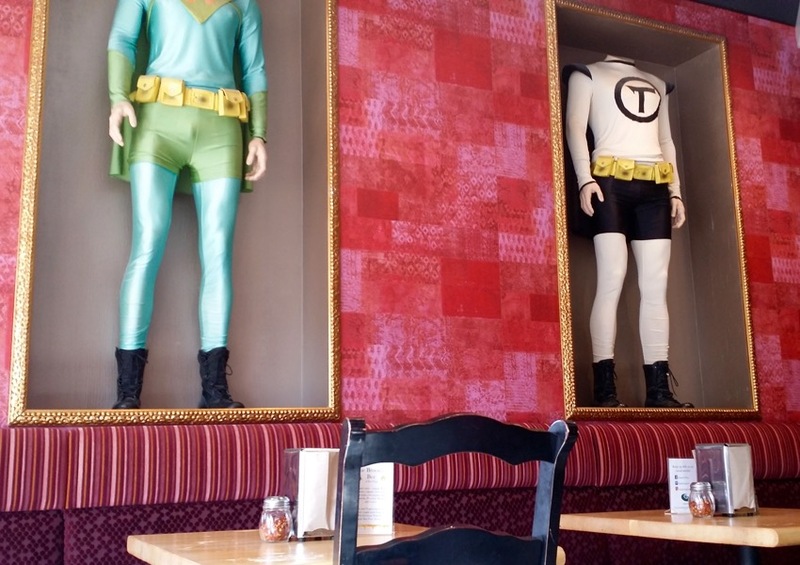 These handsome devils are pretty much the first thing you see while you wait to be seated. 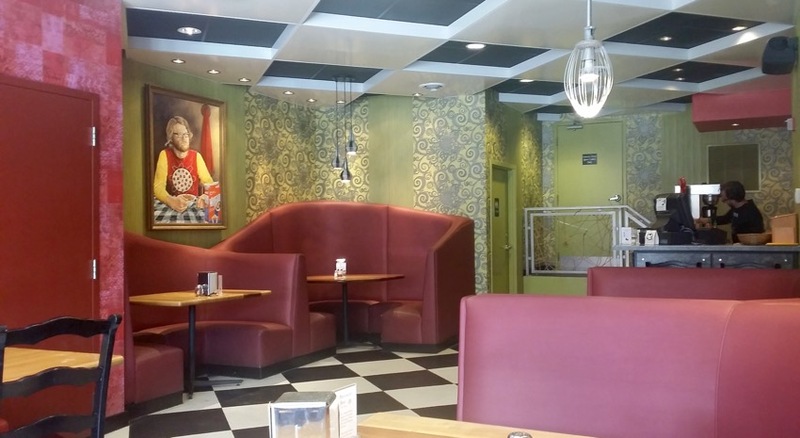 The interior has a fun, eclectic feel. 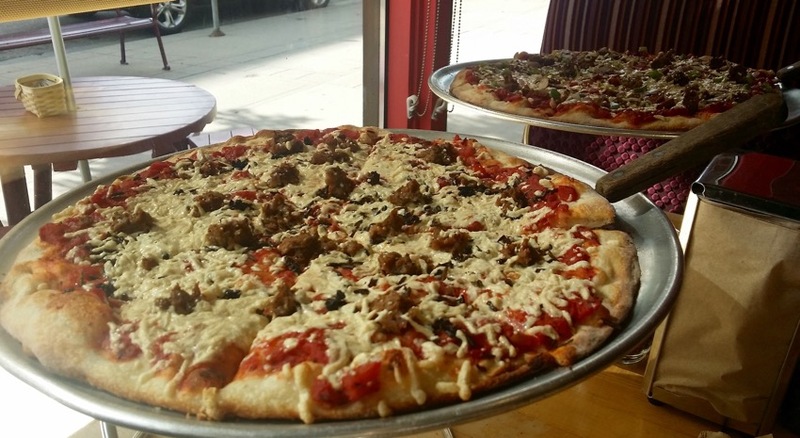 Galactic Pizza offers multiple meat & dairy-free pizza options! The menu is clearly marked with pizzas that can be ordered as vegetarian or vegan. Thus far, we’ve avoided eating at normal pizza joints because who wants a regular pizza with no cheese? It was so great to order a pizza with (dairy-free) cheese again! Dusty and I couldn’t decide which to order and we knew we wanted left overs so it was an easy decision to order two pizzas. The trick was which two to order- there were so many great options for us! We settled on the Paul Bunyan and the Old School pizzas. Our server didn’t bat an eye when we ordered two large pizzas for two people. Here’s the description straight from their online menu: This is a very special pizza. The first of its kind. All of the toppings have been selected based on the fact that they are native to the Minnesota ecosystem, giving it a unique flavor that is truly Minnesotan. It starts with our homemade tomato sauce, topped with mozzarella cheese, morel mushrooms, wild rice, and free range bison sausage. We, of course, ordered the vegan option and it was subbed with The Herbivorous Butcher meat-free meat!! We were delighted to taste this product again after being introduced to it earlier this year. In the past, this has been our go-to pizza. We love all the pizza toppings! Here’s what was on the Old School: Tomato sauce, mozzarella cheese, pepperoni, sausage, organic button mushrooms, organic green peppers, and organic red onions. Once again, the pizza was topped with a dairy-free cheese and The Herbivorous Butcher meat-free meat! We loved both pizzas equally. We left with almost a whole pizza in a to go container. Truth be told, we ate the rest of the pizza about 6 hours later on our way home from the Twin Cities that evening. It was so good we couldn’t wait to get home. It’s even good cold! We hear an awful lot lately that we should ” Be the change you wish to see in the world ” Check out all the ways Galactic Pizza is doing just that! In most cases pizza delivered to your door using 100% electric vehicles. All of the power purchased to run their restaurant is renewable wind energy. Mozzarella cheeses come from cows not treated with rBGH. Organic items into the menu. Order the Second Harvest Heartland pizza, where $1 is donated to this hunger relief organization every time the pizza is ordered. Packaging is either made from recycled materials or is 100% biodegradable. Hemp products are incorporated into each menu category and menus are printed on hemp paper. Hemp is not only good for you, it is also very good for the Earth. In season, they try to purchase all of their produce from farms here in Minnesota or in nearby Wisconsin. They have an in depth waste reduction program utilizing composting food waste and recycling whenever possible. 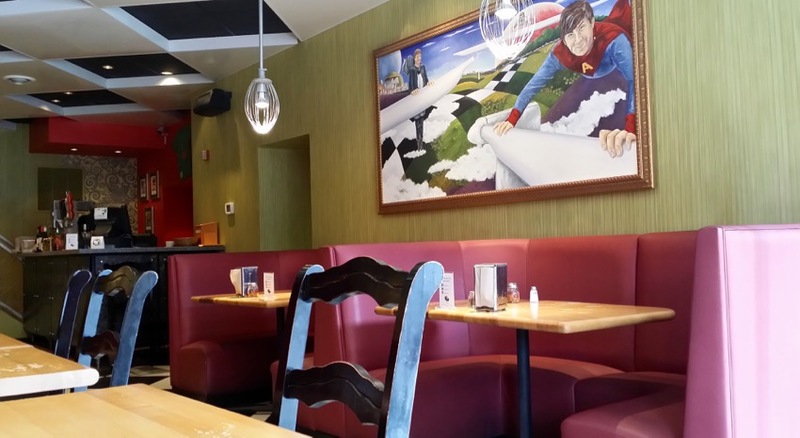 Galactic Pizza donates 5% of their pre-profits to charity. We topped our visit off with a piece of raspberry cheesecake. This was perfect and so was our experience at Galactic Pizza! 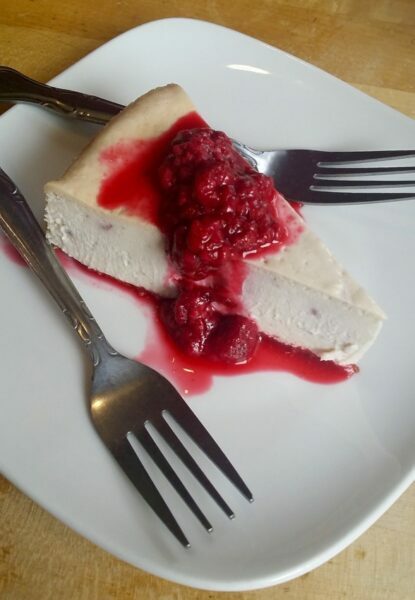 The tartness of the raspberries paired perfectly with the light sweetness of the cheesecake. Since going WFPB we have never indulged in a dairy-free cheesecake and let us tell you, this was incredible! The perfect size for sharing.